Margaret has been a beekeeper for over 30 years. She has a Master of Science in entomology, is a qualified teacher and holds the British Beekeepers' Association (BBKA) Advanced Theory Certificate in Apiculture and the General Certificate in Beekeeping Husbandry. Margaret is also a Qualified Beekeeper, a BBKA examiner and for 13 years was Deputy Editor of Bee Craft journal. There are 5 places left on this course. There are 6 places left on this course. Each course runs from 9:15am to 12:15 pm and the course fee is £120. The maximum group size is 8. Venue: Three Roofs Apiary, Quarndon, Derbyshire. 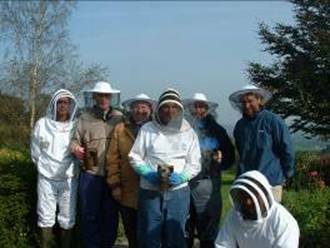 The course includes both theory and practical work and follows the syllabus for the BBKA Basic Assessment in Apiculture. 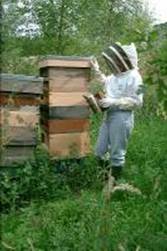 It will suit people who are thinking of taking up beekeeping or have already started. A set of course notes is provided and students will receive follow-up practical and email support. Protective suits and veils will be provided. "Meet the bees" taster sessions. Have a look inside a working bee hive then taste the honey that the bees have produced. Bee suit and veil provided.